Located 18 kilometers from Jiayuguan City, Wei-Jin Tombs are situated on the northeastern Gobi Desert in Jiayuguan. The ancient tombs are distributed over 20 kilometers. In 1972, 8 tombs were excavated and cleaned. People found the ancient 600 frescos in 6 tombs of the tombs. Most of them are well preserved and some even look new. There are more than 1,000 tombs sleeping at the Wei-Jin Tombs for hundreds of years in the desert. From the perspective of geographical layout, the tombs should be divided into family tombs. The frescoes discovered in the tombs are painted on brick facade of the tomb door, the walls of the front and middle rooms, and the stone walls of the back room. The brick facade of the tomb door are painted and engraved with Quemen and the fairy beasts. You will see the frescones of the costumes, accessories, kits and silk crepe used by the owner of the tomb at the back room. 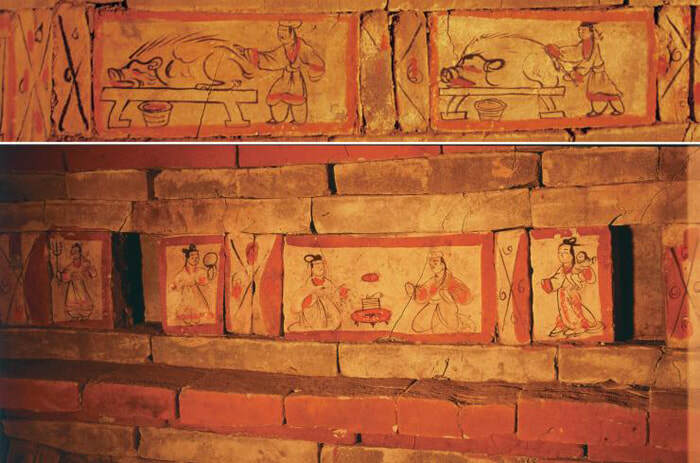 The frescoes also illustrate the scenes of the banquet, hunting, farming, travelling, feeding the livestock and harvesting in the Wei and Jin Dynasties (220 - 420). The amazing frescoes at Tomb 3, Tomb 7, Tomb 6 and Tomb 5 which have been excavated show the then social, political and economical life. Only Tomb 6 is open to the public for now. The best time to visit Wei-Jin Tombs is in the morning during the opening hours. There is no direct bus to Wei-Jin Tombs. Therefore, the only one option is to rent a vehicle from Jiayuguan. Only Tomb 6 is open to the public for now. It is not allowed to take photos in the tomb. Please check out the weather forecast beforehand as sometimes the sand storm comes by Jiayuguan. Interested in visiting the Wei Jin Tombs on a Tour? Wendy Wei Tours offers a variety of different packaged tours as well as custom tours including the Wei Jin Tombs, among other attractions and destinations. To find out more, please visit our Tours page or Contact Us directly to find out more.